Stand midway between two pulleys, holding one stirrup in each hand. Place one foot in front of the other for stability. Bend forwards slightly at the hips, keeping your back straight. Extend your arms out to your sides, keeping them slightly bent at the elbows. Your palms should be facing forward. Exhale as you slowly draw the stirrups together in an arcing motion, until they are positioned in front of your abdomen. Inhale as you slowly return the stirrups to the starting position, or until you feel a mild stretch in your chest. Maintain control of the cables at all times. Keep your body still, back straight, and your elbows slightly bent. It’s a good idea to cross the handles at the top of the movement and thus strengthen the cross-over range of motion, which you can’t strengthen with exercises such as the barbell bench press and the dumbbell fly. The cable cross-over and the dumbbell fly are similar exercises, mostly targeting the same muscles. The only major difference is that you perform one while standing and the other while lying down. One way in which the cable cross-over is better than the dumbbell fly is that, with the dumbbell fly, the resistance placed on the pectoralis major is reduced at the top of the movement, when the dumbbells are held over the chest. 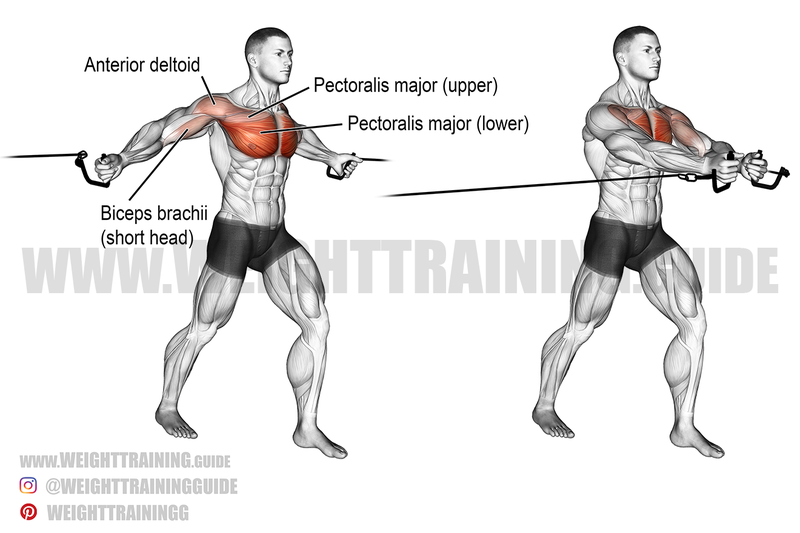 With the cable cross-over, resistance on the pectoralis major is maintained throughout the movement. Another way in which the cable cross-over beats the dumbbell fly is that it helps you to develop your standing balance, coordination, and push force, which are important for fitness and athleticism. The cable cross-over also recruits more stabilizer muscles, especially in your core. Also known as the standing cable fly. See also the low cable cross-over, which targets your upper chest. Amazing website! Loving the exercise details. Learning so much. Thanx!